EghtesadOnline: Iranian steelmakers exported 6.37 million tons of semi-finished and finished steel worth $2.34 billion in the first nine months of the current fiscal year (March 21-Dec. 21) to 15 countries. According to the Iranian Mines and Mining Industries Development and Renovation Organization, the exports registered a 23% and 3% growth in volume and value respectively year-on-year. Export destinations included Italy, Thailand, Indonesia, Afghanistan, Oman, Egypt, Taiwan, Iraq, Turkey, India, Sudan, Jordan, Belgium, the UAE and Spain. The exported products comprised hot- and cold-rolled coil, galvanized sheets, ingots, pipes and rebar, according to Financial Tribune. “Exports to Oman during the nine months stood at more than 700,000 tons worth $200 million, accounting for over half of Iran’s non-oil exports to the neighboring country during the period,” Abbas Abdolkhani, Iran’s commercial attache to Oman, said. Based on goals set in the Vision Plan (2005-25), Iran is targeting to export 8 million tons of steel by the end of the current fiscal year (March 21), 9.5 million tons in the fiscal 2018-19 and 14 million tons in 2020-21. Esfahan Steel Company has recently started exporting rebar to the UK. A company source told S&P Global Platts earlier this month that the deal for 5,000 tons at $505/ton FOB southern port was concluded in October, adding that the cargo was due in late January 2018. “Additional contracts are nearly finalized for the same destination, while another cargo is under negotiation for Scotland,” he said. This comes after ESCO became the first Iranian steelmaker to obtain UK Cares certification, confirming that its billet and rebar conform to BS 4449:2005 Standard Grade B500B. ESCO is Iran’s largest producer of long products and the only Iranian steel producer using blast furnaces, of which it has three. However, one of the furnaces (with 1 million tons/year capacity) is idle as a result of low domestic demand. About 50% of the company’s output were exported in the nine months under review to Belgium, the Netherlands, Sudan, Egypt, Thailand, Pakistan, Oman, the UAE and other parts of the Middle East, according to the company. ESCO was the second biggest Iranian steel exporter during the period, after Khouzestan Steel Company, as it shipped 805,434 tons of beam, rebar, coils and other products overseas, indicating a 87% rise year-on-year. Rebar made up 115,451 tons of ESCO’s overall exports, rising 6% YOY. It was followed by beam and coil with 80,343 tons and 48,589 tons respectively. Beam shipments were down 25% YOY, while coil exports surged 999%. The European Union announced definitive anti-dumping duties on the import of hot-rolled coil from Iran and three other countries in October 2017, while exports of semi-finished products have continued. It is the first rebar cargo shipped to a European country from Iran, a Tehran-based steel trader told Platts. Khouzestan Steel Company’s exports reached a record high of 1.94 million tons of slab, bloom and billet during the period, registering a 46% rise YOY, to remain the biggest Iranian steel exporter. Bloom exports had the lion’s share of KSC’s shipments with 861,726 tons, going up 150% YOY. Billet exports came next with 613,242 tons up 16%, followed by slabs with 499,452 tons, up 5% YOY. Despite sustaining double-digit growth each and every month this year, the ninth Iranian month (ended Dec. 21) was witness to KSC’s shipments drop 2% to reach 239,037 tons. The figure is up 41%, however, compared to the month before. According to KSC Manager Mohammad Keshani, the company is targeting the export of 2.2 million tons this year. The steelmaker, located in the southwestern Khuzestan Province, exports to over a dozen countries. About half of the exports goes to the Middle East and North Africa region, while other major export destinations are located in the Far East and Americas. Imports of steel during the same nine-month period stood at 2.91 million tons worth $1.65 billion, up 2% and 14% YOY respectively. 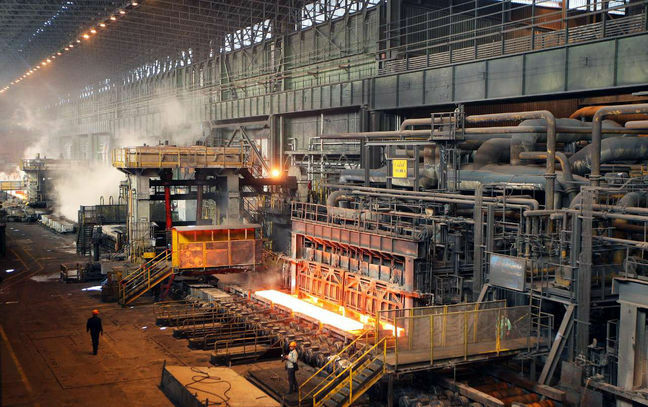 Iranian steel mills produced a total of 12.77 million tons of slab, bloom, billet and ingot, and 7.9 million tons of hot- and cold-rolled coils, rebar, beams, pipes, wide and galvanized sheet during the period to register a 19% and 5% YOY growth. An aggregate of more than 48.6 million tons of mineral products worth over $6.85 billion were exported from Iran over the nine months, up 1% and 3% respectively YOY. Direct net steel exports reached its highest in 10 years, as it hit 971,000 tons in 2016 and bested all other countries in the Middle East and North Africa region. In 2007, Iran was MENA’s largest importer of steel and its net exports stood at -11.6 million tons. The figure stood at -674,000 tons in 2015. Save for 2016, Iran was continuously in the negative territory since 2006, although it followed a steady upward trend. Iran was the world’s 14th largest producer of steel in 2017, according to statistics by World Steel Association. It was placed between Ukraine and Mexico.